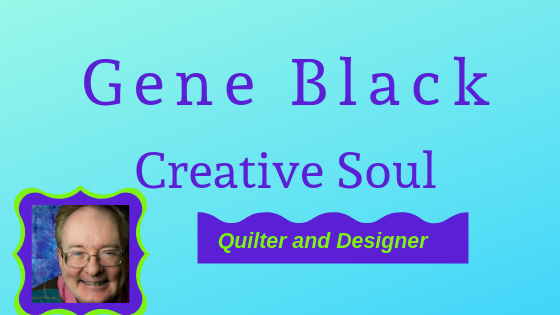 Gene Black an Alabama Artist and Quilter: Is it just me? Is it just me? Or are other of my crafty creative friends not going out to shop on this Black Friday? I far prefer to avoid the crowds. 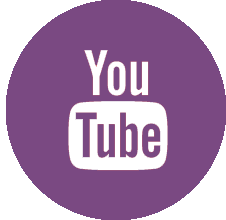 One thing I do on those stay in days is watch (or re-watch) some of the classes I have bought on Craftsy. 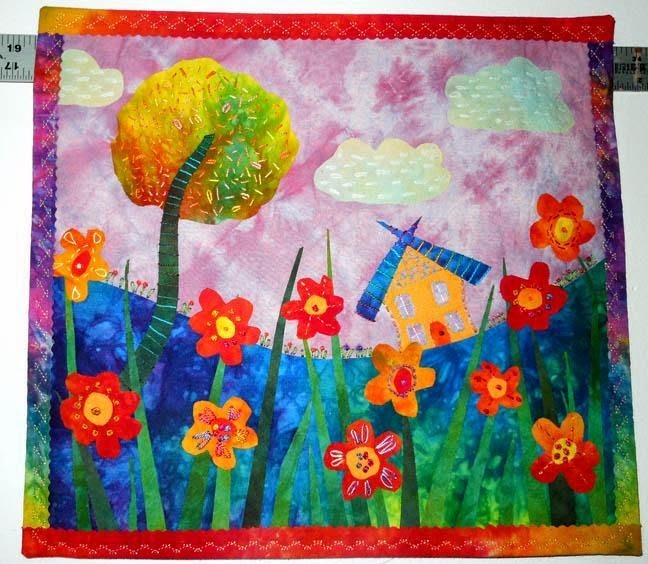 Last night I re-watched part of Laura Wasilowski's class on Handstitched Collage Quilts. I made this art quilt from that class. It is amazing how much we forget if we don't use it frequently. Fortunately, once you get a Craftsy class it is yours forever to come back and watch again. I love that feature. I also took classes to learn free motion quilting. 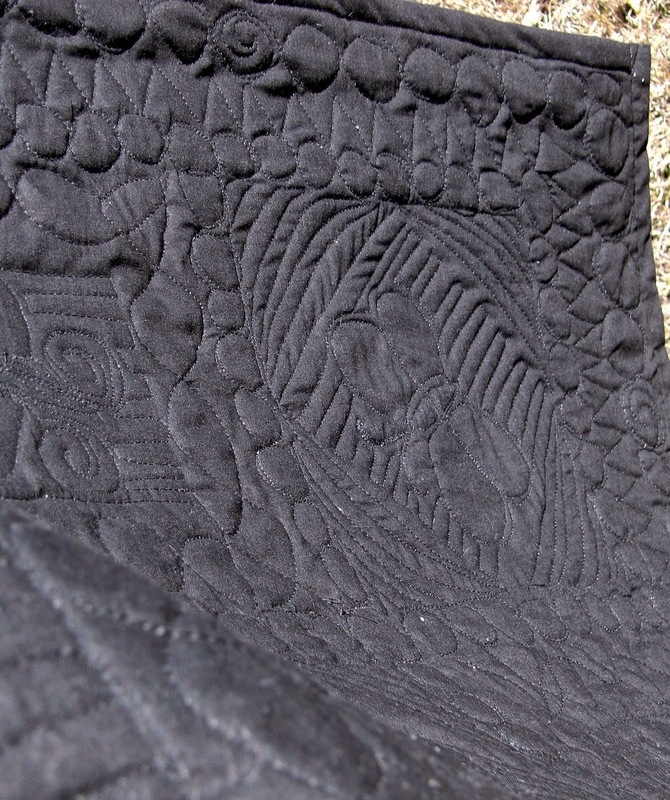 So the secret quilt I am making has some pretty good quilting on it. Here is the back of it. Craftsy has a Black Friday Sale going on now. A really nice thing is that you don't have to fight anyone in line to get a great deal. All classes are $19.99 or less. Yes, really! I saw one that was $59.99 originally - and it was only $19.99. I am thinking these classes would make great gifts for a creative friend also. There is a "Buy as a Gift" option and you can choose the delivery date - like Christmas eve, or maybe Christmas Day or perhaps Hanukkah or even a birthday. I'll be staying home too Gene, I don't like crowds and I agree that it is so neat to have the Craftsy classes forever! It's not just you! I also avoid the tradition that has become "Black Friday". I believe, however, that it's much less of an "event" now that it's been watered down by much earlier openings, some even on Thanksgiving day. Perhaps it will backfire and self-destruct. Fine by me. I need to go get a class or two. We braved Black Friday but no crowds late in the afternoon. Got a new die for my Accuquilt and some thread at Joann's. I did cybershop and got a roll of batting on Thursday. I also got two Craftsy classes for $30.00. What a deal. Yay for staying home and avoiding the mayhem! I didn't shop on Thursday or Friday. I am with you Gene I do not shop in all these crowds. I pretty much stay away from all stores til the end of the holidays-unless I need a quick run for food. Hi Gene. I didn't do anything that required me to leave the house...LOL...I had family here so I didn't do much of anything other than kissing and hugging the grands and cooking...! !